"Lepispea Caravan & Camping" has worked for several decades. Our motto is: "Treat you dear customers as you would like to get treated yourself!". We are open from 1-st of May till 30-th of September incl. 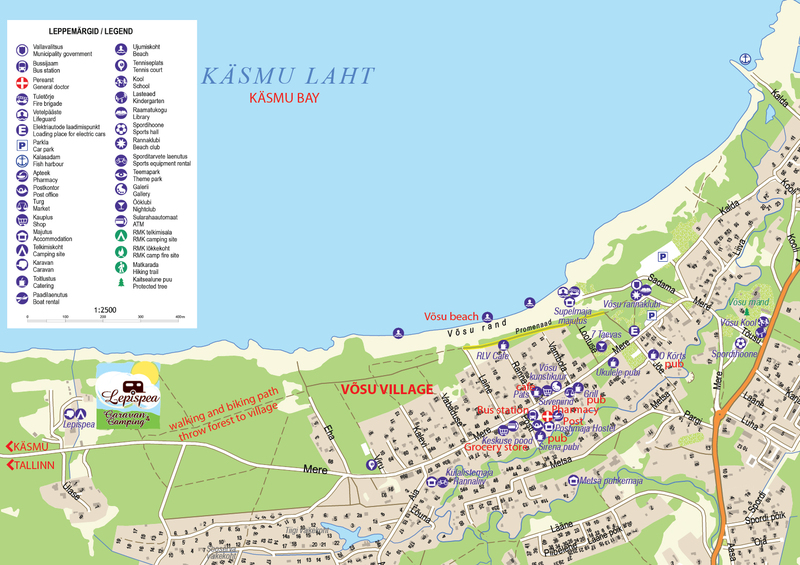 We are located in a very beautiful Lahemaa National Park, near the beach, from village of Võsu about 1km, Vihula vald. We offer a family vacation for travellers with caravans and motor - homes, for tent campers. You can come with pets. Leash for pets will be required. Price includes: 2 adults; using of toilet and shower, the possibility of settling tanks emptying, WiFi. NB! All payments in cash at the campground. We want people to enjoy their holidays as much as possible. Our campground rules are to make everyone's life a little more relaxing and encourage our visitors to show consideration for others. * Park your caravan (trailer hook) and car or motorhome front (nose) always pointing toward the road or passageway. This is number one safety rule! * When you arrive at the campground, please check inn at INFO administrator desk and pay of your planned stay fee. You will get from INFO administrator campground map and rules, requirements for safe parking. * If you will have guests, they have to be registered also at INFO administrator and pay of their stay by pricelist. * If you need tourism information, help, advice or have any difficulties please go to the INFO administrator for help. * If anyone on site disregards campground rules and disrupts the enjoyment of others, please be aware that the campground management may ask them to leave the campground. * Please make sure you and your guests, respect the comfort and convenience of other campground users. * If you have children with you on the campground, you are responsible for their supervision. * It is forbidden to drive nearby children’s playground. * Verbal or physical abuse on site won't be tolerated. This will result in you being asked to leave the campground. * To show consideration for others, please leave your pitch clean and tidy on departure. * You may only empty the contents of chemical closets at the disposal points provided. Please wrap disposable nappies and similar bulky items in a bag and place them in the bin provided. Please don't put them in the toilets or chemical closet emptying points. Please collect your waste water in a suitable container and empty it at the disposal point provided. Please don't allow it to overflow. * You must not light fires on the campground. Barbecues are permitted on campground, please make sure you keep smoke and fumes under control so you don't annoy your neighbors. Your barbecue must be raised off the ground enough to reduce fire risk and avoid grass damage. Please be sure that barbecue coals are completely extinguished after using them, if needed pour over with water. * You are responsible for your pet's behavior. You must make sure your pet is under control at all times; dogs must be kept on a secure lead. It is your responsibility to clean after your pets and clean off your pet faeces. * Please think of others and keep musical instruments, radios, televisions and so on, at a considerate noise level. Silence during the night-time, (starts at 23:00), except on special events. * Please keep your valubles, technical equipment, bikes (at night at least locked), all other things like that in safe, if possible locked inside caravan. We can not guarantee the preservation of items left unattended. * Check out is at 12:00 If you'd like to remain later on campground, not necessarily on your pitch, have a word with the INFO administrator. Be aware that charges may apply. * REPEATED VIOLATION OF CAMPGROUND RULES EQUALSEVICTION FROM THE CAMPGROUND WITH NO REFUNDS.